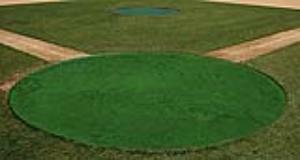 Heavy-Duty 20' Pitcher's Mound Cover constructed of 18 oz. reinforced vinyl. Offers a 3 year prorated warranty. Reinforced perimeters with brass grommets. Ground Stakes Included (7 ea).